Does anything speak of hope better than an 11-year-old from an infamous ZIP code making plans for the fall harvest? Approximately one third of the students at Holy Angels Catholic School reside in or near the Sandtown-Winchester section of West Baltimore, the 21217 ZIP code linked to despair and dysfunction during the riots that followed the death of Freddie Gray Jr. in police custody. Two weeks after Baltimore smoldered, Diana Healy asked her fifth-grade class at Holy Angels to reflect on three things as they went to work on small posters. To the matter of what positive things Ti’yon McDowell wants to do in the future, he wrote “college,” without mentioning specifics. Of what he wants for the city, “peace and love” spoke volumes. Ti’yon didn’t become animated, however, until he was asked to elaborate on his response to, “What are the positive things you do right now?” When he printed in green marker, “Growing food for our community!” what did he mean? And with that, Ti’yon, Keith Norris and Jasmine Windham were off and nearly running out a back door, for show and tell with a visitor. 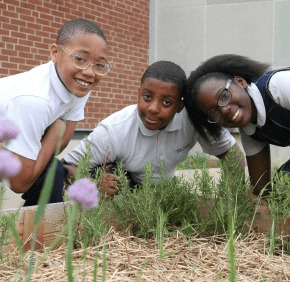 At the Holy Angels garden they help tend, the fifth-graders mentioned peas, radishes, strawberries, tomatoes, carrots, spinach, blueberries, squash and lettuce as among the fruits, vegetables and herbs to which they’ve applied a green thumb and their math skills. They also ask for blessings of “the falling of the rain” and “the growing of the grain,” prayers not quite as urgent as the ones they offered in late April, when the streets around their homes took on the feel of a war zone. Jasmine lives near St. Gregory the Great Church, one of the places Archbishop William E. Lori visited April 28, the morning after the worst of the riots. Jasmine, who “loves working with tech,” wants to attend MIT and work for Google. Keith’s shorter-term goals include going to Mount St. Joseph High School, in part because his mother wants him to, and because of the tutoring its students offer at Holy Angels once a week. Before their harvest, he and his classmates are already making a difference, as they leapt into action in late April, in response to an emergency food drive at St. Peter Claver Parish.